Gulbarga district of modern Karnataka State has been center of Jain activities since ancient time. The region of Gulbarga was center of religious and political events during the medieval period when Rashtra kumara (Rashtrakoot) and Western Chalukya reigned over territory. The Rashtrakoota and Chalukya sovereigns were tolerant to Hinduism as well as Jainism and some of the sovereigns were ardent follower of Jainism. Jainism influenced the life style, culture and customs of Karnataka in a great way. This might be possible due to practice of Jainism by sovereigns, merchants and common laity. Patronization of Jainism by monarchs rendered us some greater monuments in Gulbarga region of Karnataka. The mass population worshiped their saviors in these pantheons which are also present today describing the glorious past of Jainism. Some Jain temples are victim of iconoclasm, encroachment and conversion which attest the fact of darker history in Karnataka to a non violent creed. Some Jain sites along with inscriptions, images, pillars and remnants concerned to Jaina creed are present nearby Gulbarga city. These are Gulbarga, Sedam, Malkhed, Atanoor, Hunasi Hadigalli, Harsoor, Kalagi, Ingalgi, Mangalgi, Bhankur, Chittapur, Alluru, and Jevargi etc. Bhankur :- Bhankur village is situated about 27 Kilometers from Gulbarga city in south east direction in an industrial area. Bhankur is reckoned for Jain antiquities and 12th century Jain temple which has been renovated time to time and it has been safe from the cruel hands of iconoclast during hurricane of Muslims offenders. The temple has celebrated position in laymen from not only nearby area but also from far districts. The temple comprising of finely, artistically carved pillars, sculptures and well disciplined architecture. The ancient temple of Bhankur is situated in the middle of the village and the whole village is replete with Jaina antiquities which deserve careful investigation and attention. The temple is known as Basti Gudi. The temple has Chalukyan Architecture which is generally found in Gulbarga region. The temple had gone through more than one renovation in the vast time span. The temple comprises of several Jina sculptures including savior and subordinate god-goddess sculptures. Rishabhnatha, Chandraprabhu, Shantinatha, Vardhmaan and Yakshi Padmawati sculptures are remarkable. These sculptures are fairly big in size and these appearances are handsome with in good preserved state. 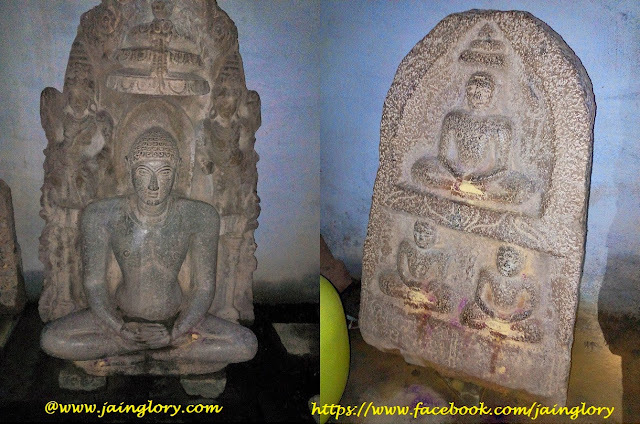 Lord Parshwanatha and Shantinatha sculptures are in kayotsarga posture with handsome proportions. These sculptures are sculpted in Chalukyan style where whisks are depicted on both side of Jina. Some seated Jina teerthankars are also depicted here in sole as well as chaubisi form. The sculptures have tranquility and serenity on their face. The unique artistic style of Chalukyan and Rashtrakoota era is worth to easy identification. A panel with two Acharya sculptures is also in the temple which is surmised as Kundakunda and Umaswami of Digambara school of Jainism. These Acharya sculptures are not depicted with triple umbrellas so the fact is corroborated that these are not saviors. Some Yakshini sculptures are also depicted in the temple those are identified as Ambika and Padmawati. The sculptures of this temple are temporary installed in a room besides the main temple because the main shrine is under maintenance and renovation. The heritage architecture of Chalukyan style would be preserved in this renovation. A priest living near the temple worships the Jinas daily. History of Bhankur :-The Jaina vestiges scattered in the village along with Jain temple and sculptures are hailed from 12th century of medieval epoch. The village has references in local records as Bamakura in later days and earlier version of Bamakura was Bhomukura is referred in eleventh century inscription. Earlier and original name of the Bhankur village was Bhumukura which means “Mirror of the earth”. An inscription hailed from 13th century inscribed on the pedestal of Tri sculpture written in Kannada language has records about Shree Kanak Kirti. The inscription is not in readable form. Only few words are extractable from this record. The village contains Rameshwara temple which was Jain temple once and appropriated by ViraShaiva Lingayats in 1184 AD. The village Bhankur has also vestiges of two Jain temple about 2 Kilometers from Bhankur Village. Consequently, we can assert that the village Bhankur was a great seat of Jina creed with a mass population of Jina adherents.